Its addition in wet concrete improves its watertightness, and increases its mass density as well as its plasticity. It also enhances all its mechanical stengths, reducing by 10% the water/cement ratio. 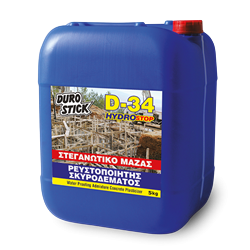 Necessary for creating watertight foundations on soil with increased moisture levels. From 0.3 to 0.5% of the total weight of concrete.